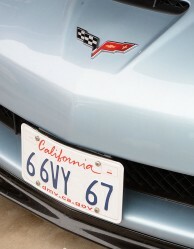 Up until just recently, I never had a front license plate on any of our Corvettes except the '71 Big-Block hot rod–it was one of those old "Chevrolet: The Heartbeat of America" plates from way back in the '80s. Since front plates on chrome-bumper C3s look ok, the classic "Heartbeat" plate was acceptable. For the last 10 years, I’ve been a National Corvette Caravan Section Captain out in the Southwestern U.S. and one tidbit I've heard on the Captain’s "grape vine" lately is that, since traffic enforcement using cameras has really caught on, states which require front plates are enforcing those laws more aggressively–for the obvious financial reasons. Before camera-based enforcement of speed limits and red light compliance became widespread, front plate laws were either not enforced, enforced when an officer needed some probable cause to stop a motorist or enforced in localities which customarily carry on stringent enforcement policy. In other words, you didn’t have to worry much about front plates, even if your State required them. Not wanting to get stopped while leading a Caravan by some officer engaged in revenue enhancement...ooops....traffic enforcement, I considered options for mounting a front plate on my ‘12 Z06 and nothing in my initial search looked good–either the plate positioni looked ugly or once the plate was mounted, it was not easy to remove for shows or trackdays. Finally, about a month ago, right here on the CAC, I saw a post by “Top Flight Reproductions” about its “Removable Front Plate Bracket Kit." Imagery on the company’s web site showed a front plate mount that looked pretty darn good and described a product which allowed the plate to be easily removed for shows, trackdays or any other use where no front plate is desired. I ordered one of Top Flight Reproduction’s kits (PN 00100003-3). When the product arrived, I was struck by its elegant simplicity: two brackets, the first of which is affixed under the roof of the front grille opening using a semi-permanent, industrial adhesive. The second bracket, fastened to the upper bracket by wing nuts, holds the license plate. The installation of this product is relatively simple and does not require any tools other than a screwdriver. The only part of the job that is a little tricky is the proper positioning of the upper section of the bracket kit. Top Flight Reproductions' instructions are detailed and include imagery so, as long as one follows the company's instructions, that part of the process should go ok. Once you have the upper bracket in place, you wait for the adhesive to fully cure then install the lower bracket using the wing nuts and, finally; screw your plate in place with the hardware provided. Once the adhesive had set, I put my front plate on and I loved the look. Top Flight Reproductions, also, sells optional color-keyed license plate frames. If you want your front plate to look even better, add one of those to your order. Since this Top Flight Reproductions' Removable Front Plate Mount puts the front plate smack dab in the middle of cooling airflow, I wanted to road test the product to assess it's affect on cooling, if any. In normal driving and in congested traffic on an urban freeway, I didn’t see any significant change in the car’s cooling, however, the testing was done in the dead of winter so I was unable to determine the plate mount’s affect on cooling air flow while the engine was under a heavy cooling load and because of that, I would suggest that anyone taking a car fitted with the Top Flight Reproductions to the track, remove front plate–which is now very easy. Just undo the wingnuts. If necessary, I'll update this review once summer comes and I have a chance to reassess the car's cooling. For more information, visit the Top Flight Reproductions web site.